WordPress received a set of plugin updates today. The Jetpack plugin was updated to version 2.5 resolving an issue of the Twitter widget not displaying tweets. The issue had to deal with the Twitter widget ID not being saved properly in Jetpack’s Twitter widget. A Twitter site owner needs to create a Twitter widget first in twitter.com as a pre-requisite to using this WordPress widget. The widget works properly now. You know there’s a however coming next, right? However, certain browser add ons or extensions may prevent it from displaying properly. In the event that you still do not see the Twitter timeline, then first clear the browser cache and settings (Google it if you don’t know how), and see if it works. If that does not work, then disable your add ons and figure out which add-on was preventing it from being displayed by re-enabling the add-ons (Firefox) or extensions (Chrome) one at a time to figure out which one. The other plugins that were updated were: SI Captcha, WordPress SEO, and WP-PostRatings. Please go to the respective plugin sites to look at what was updated for these. In between terms, we will be looking to upgrade the WordPress version to the latest, as that change will be more involved and require a longer period of downtime. Posted in Maintenance and Updates, WordPress. If you have turned on Jetpack on your site, and are collecting stats, at the very bottom of your site you might notice a little smiley face. If you are like me, you will find this just a little bit annoying. How did it get there? Is this a bug? Is there something wrong with one of my posts? The answer is no. It goes back to using Jetpack and collecting stats. 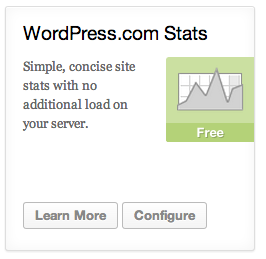 Since you are using the power of the WordPress cloud at wordpress.com when you connect Jetpack, WordPress inserts this to indicate stats are being collected. Well and good, but if you are not in a smiley frame of mind, it’s very easy to fix. 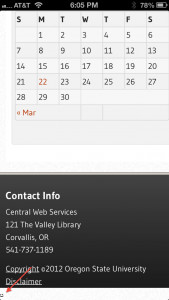 To take the smiley off your page, go to the Jetpack dashboard, and click on the Configure. In the configuration options you will see a checkbox to “Hide the stats smiley face image.” Just check that and save and you are smiley free, and free to smile. Posted in Blogs, Maintenance and Updates, WordPress. With this next update of WordPress, we have updated WordPress core as well as plugins, and have introduced a new plugin called Jetpack. From our standpoint it is a number of WordPress modules that will add some benefit to your site, including site subscriptions, posting a blog post via email and more. But to use Jetpack you have to understand the peculiarities and actually see if some of the features will work with the theme that is being used. In a nutshell, the theme has to be able to support Jetpack. We are outlining some of the steps and peculiarities that we have encountered in our testing with the OSU Responsive theme which is the primary theme we are testing against at this time. All other themes are unsupported for Jetpack at this time. 1. First you will need to connect to wordpress.com, which means you need a wordpress.com account. Best practice for departments and organizations. Create a wordpress.com with a generic account. That way it can stay with the organization rather than with an individual. Why do you need a wordpress.com account? The plugin itself uses wordpress.com’s cloud infrastructure to do some of the processing, and where we can offload some of this is a good thing. 2. 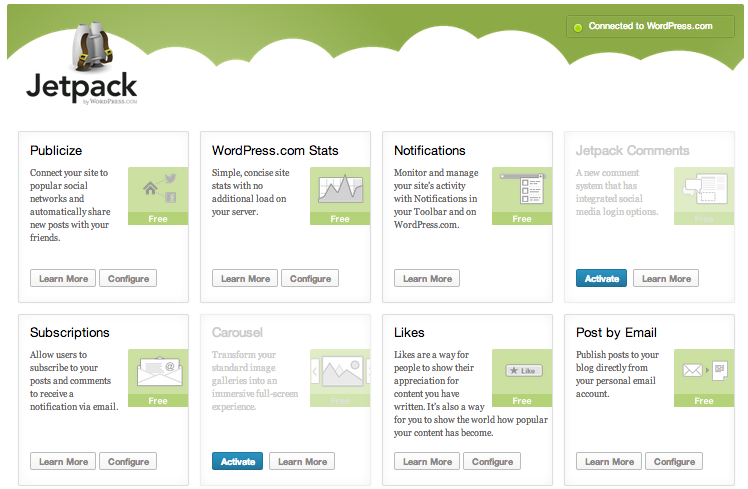 Then connect to Jetpack from the Jetpack Dashboard. 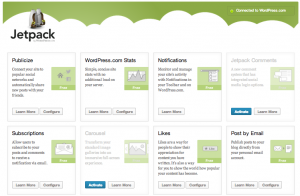 Once you connect to a wordpress.com account, you will see the Connected in your Jetpack screen navigated to from your Dashboard. 3. Next is to look at the variety of options and activate the ones you would like to use. Please note that not all of these might work with the theme that is being used. For OSU Responsive, WordPress.com Stats, Subscriptions, Carousel, Like, Post by Email, Sharing, Contact have all been tested in our limited testing capabilities. 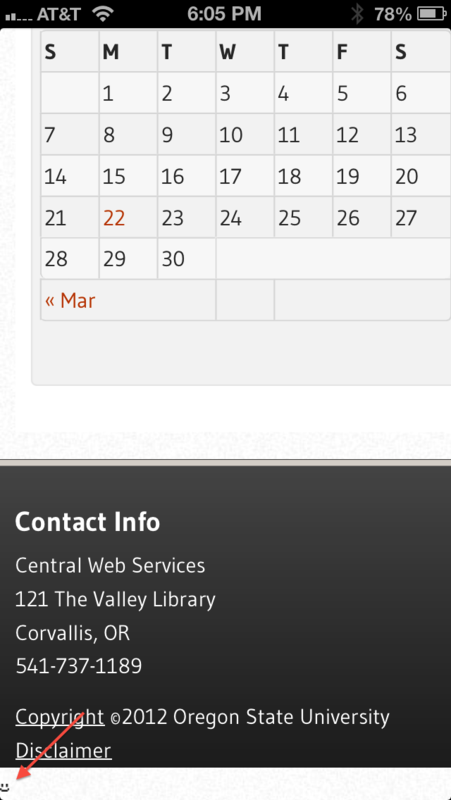 Please note the Contacts feature of Jetpack is not compatible with the Sociable plugin. You can disable Sociable under Plugins menu located on the left in your administrative menu. So you get all that done and you decide you don’t want to use one of the features any more. But where to turn it off? It wasn’t intuitive when I first went looking for it, that was certain, but a quick Google search found the answer. Once a Jetpack feature is activated, there might be a configure button there. If it is clicked, it will expand the area, and it is in that expanded area that the Deactivate button will be. Why there? I don’t know but after using it a few times, I was able to manage remembering where it was the next time around. Overall it looks like some good pieces are there. As you are using this, remember to keep in mind everyone. There are accessibility policies to keep in mind, as well as just a general sense of if you really will be using a a feature that is activated. As we get more information we will put up, but the best thing right now is to visit the Jetpack site for more information. We’ll be writing more as we use the features ourselves. As always we would love to hear your feedback, so try out the contact form that we’ve just put in as part of the Jetpack feature set and send us some feedback about your experience with Jetpack. 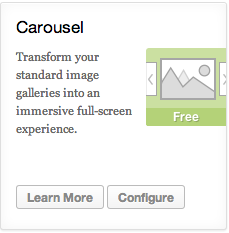 In the intervening time between our blog posts, we still have some work to do to fix the Responsive menu structure. More than one level deep in a menu and it isn’t too useful and on the mobile side, the mobile menu has a bug we know about that does not expand it beyond a certain length, making part of the menu not visible. That fix is in the works. At this point, however, we want to give you the ability to take off with Jetpack.